My people’s answers are below. 1. How do I adopt a German Shepherd from your organization? 2. What is the adoption fee and what does it include? Our fees are $400 for dogs under 12 months, $350 for dogs from 1 year to 6 years and $200 for dogs 7 years and older. Our average cost per dog is $650 and we welcome donations to cover the spread in adoption fees and cost. All dogs are altered, vaccinated, microchipped and registered with Finding Rover prior to adoption. 3. How long is the adoption process? Our goal is to have your approval to adopt completed within two weeks depending on our volunteers' availability and your schedule. The match to a dog is dependent on the right fit between a rescue dog in our program and you upon approval. Our inventory of dogs ready for adoption changes based on the number of dogs that pass our evaluation criteria to enter our rescue and their individual readiness once in our rescue. It can be a feast or famine situation depending on availability at shelters, owner surrender calls and foster home availability. We advertise available dogs on our website, PetFinder and Adopt-a-Pet along with social media posts on Facebook, Twitter and Instagram. Our dogs are placed in volunteer foster homes for us to learn about their individual behaviors and traits. Foster homes allow our dogs to decompress and receive loving care along with structure of living in a home environment. We board our program dogs only if a foster family has travel plans and a back-up fosterer isn't available. Our dogs come from local animal control shelters, owners who must surrender their dogs due to personal circumstances, or partners such as vets or trainers. Our foster homes provide insight into each dog's personality and information about the dog's experiences with kids, cats, and dogs. This allows us to match each dog based on its temperament, activity level, and needs. Keep in mind that each foster home is a bit different, but we do our best to gather as much information as possible so we can make the perfect match. Yes, as a rescue organization we are required by law to spay and neuter before transferring ownership to you. Yes, we recognize that health, economic circumstances and other factors may result in the need to find a new home for a much loved pet. All dogs entering our rescue must pass our evaluation and we do not accept potentially dangerous or aggressive dogs that may endanger our volunteers and adopters. You may in limited circumstances, however, we prefer that you adopt one dog at a time in order to get to know him/her and address any possible training issues before you adopt another dog. Since each of our dogs has been let down by prior circumstances, we believe they would enjoy your undivided attention to integrate to your household. We love repeat adopters and will be ready to assist you with another dog in as little as a few months after your first adoption. We ask for you to have at a minimum 6 foot or higher fencing as German Shepherds can easily clear fencing. We will also ask you to repair broken fencing before you can adopt. In certain circumstances where fencing is not possible, we will need to understand your plans for exercising and keeping your dog safe during elimination breaks. Majority of our puppies and younger dogs arrive without any training and their first time residing indoors may be in our program. Some of our older dogs will have basic house manners and obedience commands, others will not. Our foster homes work on crate, potty and basic training for their foster dogs. We share with you our observations about the progress that the dog is making in our program. We ask our adopters to commit to formal training for our puppies and young dogs, but strongly encourage ALL of our adopters to commit to training with their dogs since training helps to establish a good foundation and contributes to a faster bonding experience. We will share any medical information we have about the dog prior to adoption. However, since these are dogs whose familial history is unknown to us, we cannot offer any guarantees of their health. We ask that you obtain a veterinary exam of your adopted pet within two weeks of adoption. You are your dog's second chance at a stable loving life, so we ask that you take the decision to adopt a rescue dog very seriously and make every effort to work through any challenges before making a decision to return your dog to us. This may include, but is not limited to, reaching out to your ShepHeroes adoption counselor or other member of our team for advice or resources, or seeking appropriate training from a professional trainer. We believe dogs can reside in apartments with an owner who will provide breed appropriate daily exercise and access to outside for elimination. However, given the proximity of living, it's a decision that will need additional consideration of neighbors and formal approval from your landlord. Keep in mind that many apartment complexes have weight or breed restrictions that may include purebred German Shepherds or mixes, so please check with your landlord first to determine the rules for your individual situation. Our puppy adoptions are generally limited to adopters with strong experience in raising large working breed dogs with the resources to guide a puppy to adulthood. We ask that you bring all of your family members, including your dogs, to meet your potential new dog. We would like to make sure that all are compatible in a neutral setting before we move forward with an adoption. 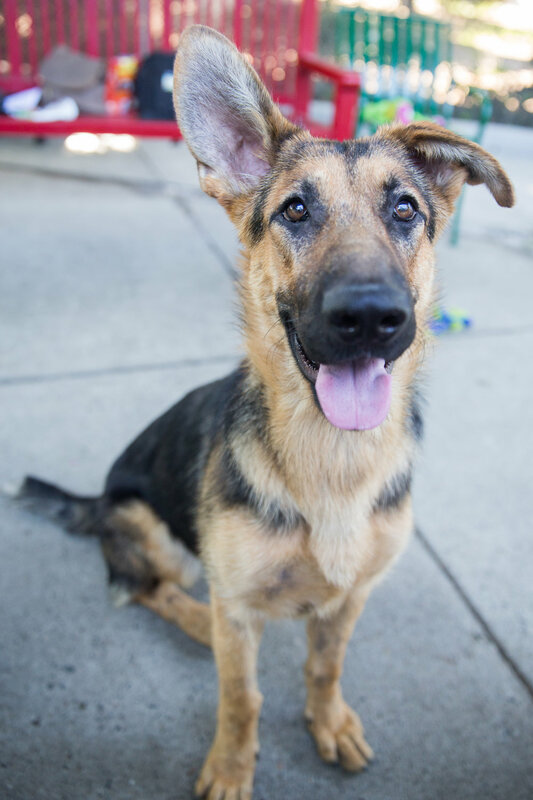 Once you are approved for a dog, your ShepHeroes adoption counselor will help to facilitate a meeting with the dogs whose temperament and needs are a match. We would like the match we make for you and the dog to be a permanent one, so ensuring the right setting for a second chance for our dogs is important to us. 20. What will the Adoption Counselor be looking for during the approval process and home visit? Your adoption counselor will be establishing a relationship with you to understand your experience with dogs, what you are looking for in a dog, and how you want to integrate a dog into your life. We would be remiss if we placed a dog with you that is not a match in temperament and energy level. German Shepherds are very social pack dogs who thrive being with their owners, so your long hours away will be problematic unless there is a mitigating plan. Without your company and appropriate exercise to bleed off their energy, they will become problematic dogs. One of the reasons we see German Shepherds at risk is due to the lack of time and attention from their prior owners, most of whom are not aware of this breed's needs. Our team is extremely experienced in making matches and we have years of rescue experience specific to German Shepherd Dogs. Once you've been approved to adopt by your adoption counselor, s/he will connect you to our team of dog managers and foster families to determine the best choice of dogs available to you. If we don't have a dog that's a good match, we will either request that you to wait for us to receive a dog that may be a potential match, or we can refer you to partner rescues who may have an immediate match. 23. What if two people want the same dog - How do you decide? We match based on the best outcome for the dog's needs, temperament and activity level, and we work to find a match for anyone who may have been disappointed at missing out on a particular dog. 24. Do you adopt to homes out of state? Rarely, but we do make case-by-case exceptions for exceptionally strong candidates depending on our resources and fit. WHEW, thanks for reading through the FAQs!